The Teen Economists: GoCompare: Major Hate or Clever Scheme? Personally this one's my favourite. The first two billboards that I saw with the apparently defaced posters were fairly close together, so I thought that someone who has serious issues with the GoCompare mascot must have done it. But then I started seeing them all over Birmingham and I became suspicious. Why would someone go to the hassle of ruining all of the posters ? Why would they trapeze all over Birmingham just to settle their differences with Gio Compario (the man shown on the posters)? How could hold such a tremendous grudge against a fictional character? GoCompare have certainly been very busy lately with their new advertising campaigns, and another one of their amusing adverts is the one on the radio. Someone telephones GoCompare's customer helpline and starts complaining about Gio. They continue complaining for a while, and then instead of responding to the caller's statements, the person on the other end hangs up. The advert ends with "GoCompare: saving the nation". The fact that not many people like Gio Compario is widely known, and GoCompare have evidently used this to their advantage. They hadn't intended to create a character that so many people hate, but that is what has occurred, and they've used this to successfully attract the public's attention in a more funny and interesting manner, making this a textbook case of effective advertising. 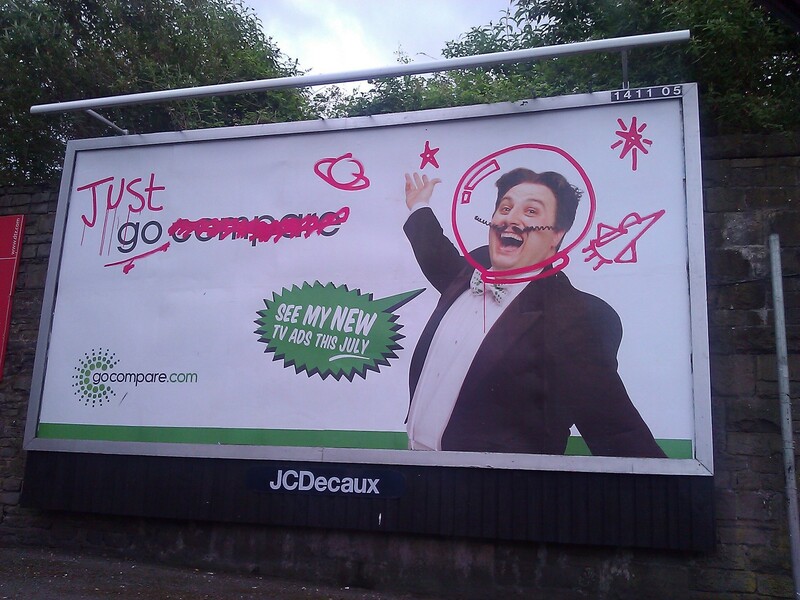 The first thing GoCompare did was create billboard adverts that would engage people and satisfy their hunger to see Gio "go down". They then kept on reinforcing their brand name by putting the billboard ads everywhere and by launching a frequently shown TV advert. Through the use of their amusing radio adverts, they've managed to cover all mediums of advertising to capitalize on the public's hate for Gio Compario. This new advertising campaign will probably work really well because people don't like Gio, and the adverts satisfy their need to see something bad happen to him. Viewers can easily relate to the adverts, and they're definitely memorable. People who had never heard of the company before would be intrigued and would most likely search it up as soon as they possibly could, and people who'd heard of it but had never been on the website would probably visit it to see what all the commotion is about. The most important thing that has made this campaign successful is that they are constantly reinforcing their brand name and reminding people of their presence. What do you think? Are you still convinced it's the haters of Gio who have defaced the adverts? If you agree that this is an advertising scheme, how effective would you say it has been?